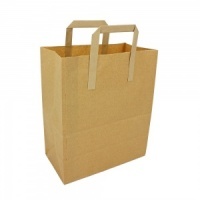 In extra thick quality 70gsm and 80gsm pure Kraft paper, these block bottom carrier bags are fantastic for food and retail use. A great value eco friendly alternative to plastic bags. Featuring sturdy tape handles and block bottom SOS construction.